Zeagle Express is located in Zephyrhills, Florida and is owned and operated by Aquatic Adventures of Florida. 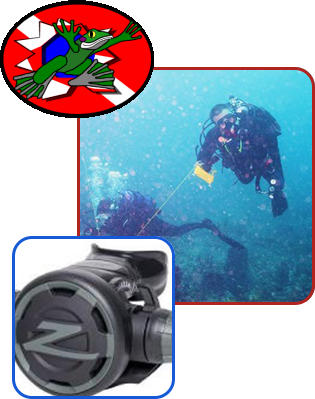 We are a factory-authorized online scuba diving gear equipment dealer, offering full-factory warranties on all scuba gear and dive equipment we sell. We are a year-round business dealing with all types of diving throughout Florida having certified scuba instructors who can teach you the basics to more advanced levels of diving. Our scuba instructors are members of several diving organizations focused on delivering to you the highest quality in diver education. Our Primary Goal in scuba instruction is for our clients to perfect safe and efficient scuba diving skills whilst learning about the underwater world. We love what we do and it shows in the commitment we make in teaching each student based on their personal needs. We quarantee each student will learn the skills needed to safely experience scuba diving and the beauty of the aquatic world but the student must understand that scuba diving has risks. We do not just issue cards for attending a class, we show you the way to the Aquatic Adventure you're looking for. Wether you wish to go exploring the ocean's reefs, snorkeling with manatees to penetrating a underwater cave, we can get you there. SIgn up today for one of our many scuba classes. You will not be disappointed. We quarantee it! "Just wanted to say thanks for the great experiences and training over the past several months! Advance Nitrox and Deco Procedures -It would be difficult to find another instructor with the same level of enthusiasm, professionalism and dedication to the student! My business travel is hectic and caused the training to continue over several months. The course was very challenging and rewarding! I am thankful that you never gave up on me! I think every diver should take this course, the knowledge and experience would make us all better divers.